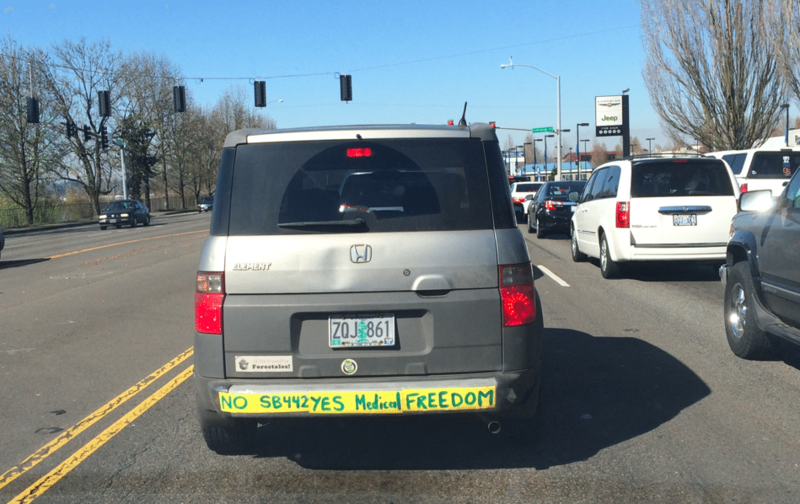 Fourteen of us from southern Oregon drove to Salem this past Monday, March 9, 2015, to attend a medical freedom rally on the steps of the state Capitol building. We made the 4.5-hour trek to Salem to protest Senate Bill 442, a misguided piece of legislation that was introduced to the Oregon senate’s healthcare committee by a family physician who is also a senator from Beaverton named Elizabeth Steiner Hayward. 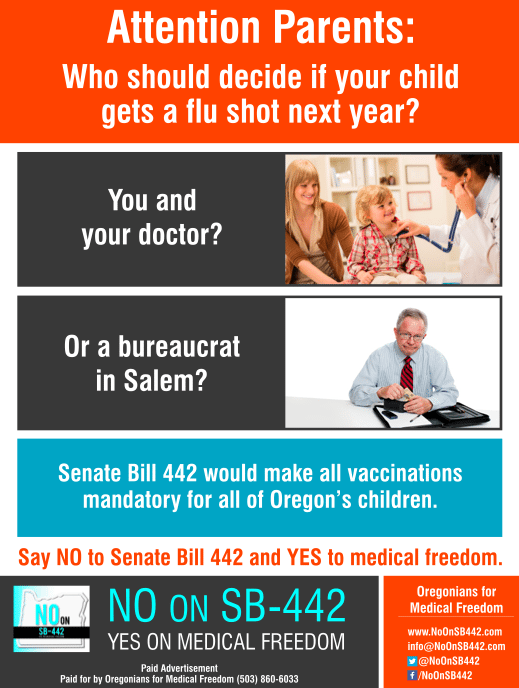 SB-442 sought to bar Oregon’s children from public and private school, as well as from daycare centers, if they were missing even just one vaccine on the recommended schedule. I counted over 300 people in attendance. Over a dozen people spoke, including Dr. Paul Thomas, M.D., a prominent and much loved pediatrician in Portland, and Robert Snee, a Portland-based attorney. We also heard from registered nurses, a mom of eight, a 17-year-old high school student, a stay-at-home dad, several people in the religious community, including a Christian Scientist, and others. A diversity of opinions were expressed but all the speakers had something in common: they did not appreciate the attempted assault by the Oregon legislature to limit their medical freedom. I write this in the past tense because two days ago Senator Steiner Hayward announced that she was withdrawing the bill. Steiner Hayward, who was the bill’s chief sponsor, did not have enough votes in either the senate or the house in order for it to pass. The same day, Wednesday, March 11, 2015, a bill to limit exemptions in Washington State also died. Wednesday, March 11 was a good day for champions of medical freedom, parental rights, and for anyone who believes that medical decisions should be made in the privacy of a doctor’s office and not by state legislators. 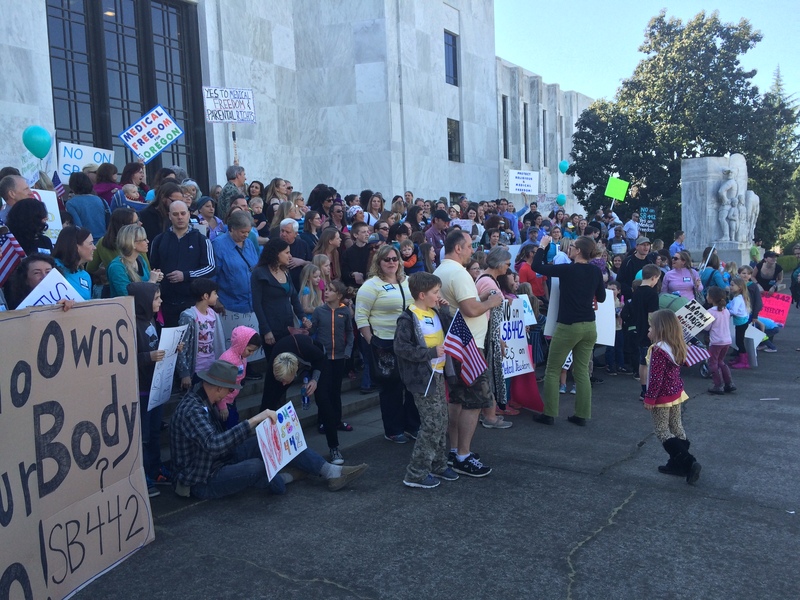 This fight is far from over in Oregon, and similar bills are coming up for consideration in dozens of other states. Elizabeth Steiner Hayward has pledged to continue to pursue options to find other ways to exclude Oregon’s children from school. I want to believe that every Oregon senator cares about Oregon’s children. I want to believe that the motivation behind championing this kind of legislation is to help promote the good health of every Oregonian. Although the mainstream media continues to repeat inaccurate information that is simply untrue, it turns out that Oregon is doing very well. There is no health crisis here. The one case of measles (1) in a population of over 3.9 million Oregonians in Lane County did not spread. Perhaps because Oregonians are healthy and able to contain the spread of disease, whether children are vaccinated or not. We actually have good “herd immunity” in Oregon. Contrary to what you’ve been reading, the rates of unvaccinated children for contagious diseases like measles are *not* actually rising in Oregon, *nor* are they rising across the country. These rates have actually remained remarkably static. Let me repeat, Oregon is a state that meets or exceeds national averages for every vaccine on the schedule and has such high rates of vaccination among school-aged children that our herd immunity is assured. From the state’s own statistics, which is the only reliable source of information about vaccine exemptions in Oregon. It would be nice if journalists would stop repeating misinformation (looking at my colleagues over at the Oregonian) and actually simply *read* the state statistics. Anyone researching this issue also needs to understand what they are looking at. Why would any American parent be crazy enough to forgo hepatitis B? Hepatitis B is a sexually transmitted disease and arguably America’s most controversial childhood vaccine. The vast majority of European countries do not give a birth dose—or any dose—of hepatitis B because doctors and healthcare providers and public health officials all understand what is obvious to any not-for-profit medical system: children who are not sexually active and do not use drugs have little to no chance of catching hepatitis B. If a mom is hepatitis B positive, a prostitute, or an intravenous drug user, the protocol changes, of course. For children of parents in these high-risk groups, hep B *is* medically indicated. I believe that vaccines work. Because I choose to vaccinate my children, I have nothing to fear from anyone who makes a different choice from mine. Unvaccinated children cannot and do not put other children at risk. The oft-repeated fear-mongering motto that an unvaccinated child is somehow going to be a vector for deadly diseases has no scientific basis in fact. Many of the parents, educators, nurses, doctors, activists, and religious leaders who have been protesting against Oregon’s bill to mandate vaccines have themselves chosen to vaccinate their children. The debate here is not about the efficacy or safety of vaccines—though those conversations need to be happening as well—the debate here is whether state senators should be choosing when and how I inject a pharmaceutical product (that, incidentally, I also have to pay for) into my children. Oregonians spoke and this week our senators listened. Though one senator’s intern glared at the 18 people who visited his boss’s office (maybe that was just his normal facial expression? Maybe he was having a bad day?) and though some aides were openly hostile on the phone when constituents called to voice their concerns about SB-442, I have been very impressed by and grateful for the thoughtfulness, reasonableness, and openness to dialogue that Oregon’s lawmakers have shown around this issue. As I told Senator Alan Bates during a teleconference Wednesday morning, his constituents in southern Oregon appreciate everything he does to improve the lives of Oregon’s children, from working to get more funding for education to fighting poverty and homelessness. Since Oregon’s vaccine rates are not actually a problem, I hope the controversy surrounding SB-442 will lead us to a statewide—and nationwide—conversation about how to tackle the real health problems facing our kids. 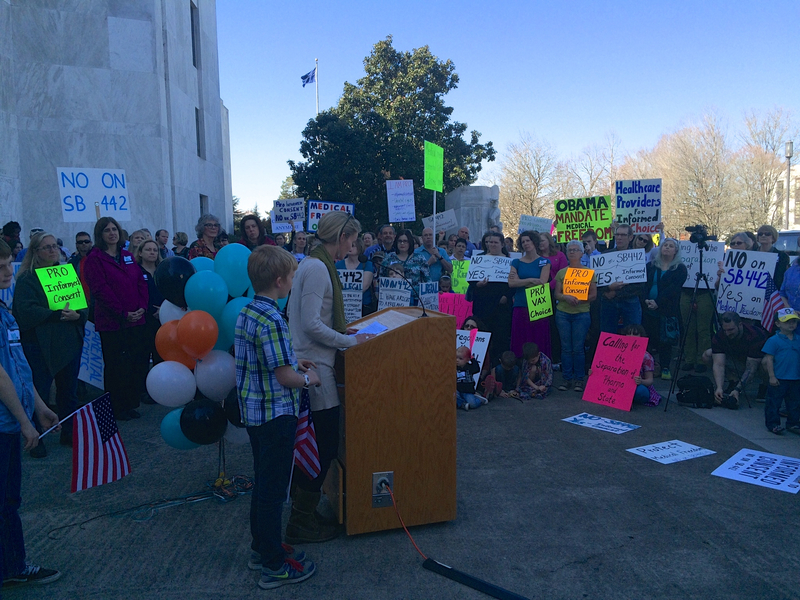 Anna Houppermans, a mom of three and third generation Oregonian, speaking in favor of medical freedom. 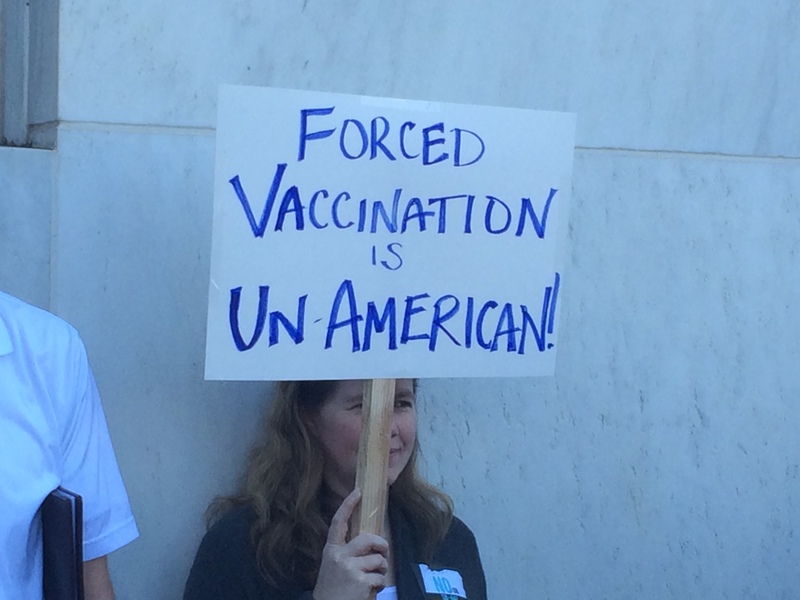 Everyone at the rally agreed that forced vaccination is un-American. Anna has given me permission to reprint her speech in its entirety. My name is Anna Houppermans. I am the mother of three young boys. My husband and I live and work in Southern Oregon where we own two businesses. I am also a licensed realtor. I consider myself both spiritual and Christian. But most importantly, I am a third generation Oregonian. My family is proud to be from Oregon, a state known even today for the adventurous, independent, freethinking zest that first brought Americans out West over a century ago. We Oregonians, like all Americans, cherish our individuality, our freedoms as citizens, the right to choose what religion to practice and how we practice it, the right to speak out for what we believe, and the right to make choices regarding our health and our bodies. In the fall of 2013 our family packed our belongings into our car and drove 2,300 miles into Mexico, where we lived for six months. Several months before we left, I visited our family physician, a Stanford-educated medical doctor. My doctor and I have a close relationship. He attended two of my three births. He respects my opinions and I respect his. He listens to me and I listen to him. He has been our doctor for almost ten years. He knows that both my husband and I are participatory rather then passive about our health care. I went to my doctor to talk about the potential health issues that might arise in a developing country, and to ask what additional vaccines my family might need, since we were going to live in Mexico. My doctor and I sat and talked for almost an hour. We went carefully through the risks and benefits of each vaccines. I left his office feeling educated and empowered. My doctor had personalized our care to suit the needs of our family. I was then able to go home, discuss what I learned with my husband, continue my own research and make the best, most education decision. My boys got all the vaccinations they needed. This is an example of healthcare at its finest. Oregonians do not want or need the state legislature or the federal government to tell us how to take care of our children. We Oregonians can sit down with our doctors in the privacy of their offices and work together to make the best decisions. The best health care is not one-size-fits-all. It must be as unique and individual as each and every one of us is unique and individual. What works well for one family or one child might not work for another family or another child, and could potentially cause. SB 442 views our children and families as a herd. My children are not cows. This is not a debate about vaccines. Opposing SB 442 is about protecting ALL our civil liberties, personal freedoms, and the right to choose. As a Christian who believes in religious freedom and a life long Democrat, I call on Oregon’s Democrats to STOP supporting this bill and start championing our basic rights as parents to make medical decisions for our children. I believe in helping parents make informed choices. Let’s dialogue with families, like my beloved doctor does, and let’s educate them about vaccines, as the legislation introduced and implemented last year does. It is wrong to limit parents’ rights to philosophical and religious freedom. This bill is unpatriotic, un-American, and un-Oregonian. I am a mother, I am a Democrat. I am a freethinking individual. I believe in public health. 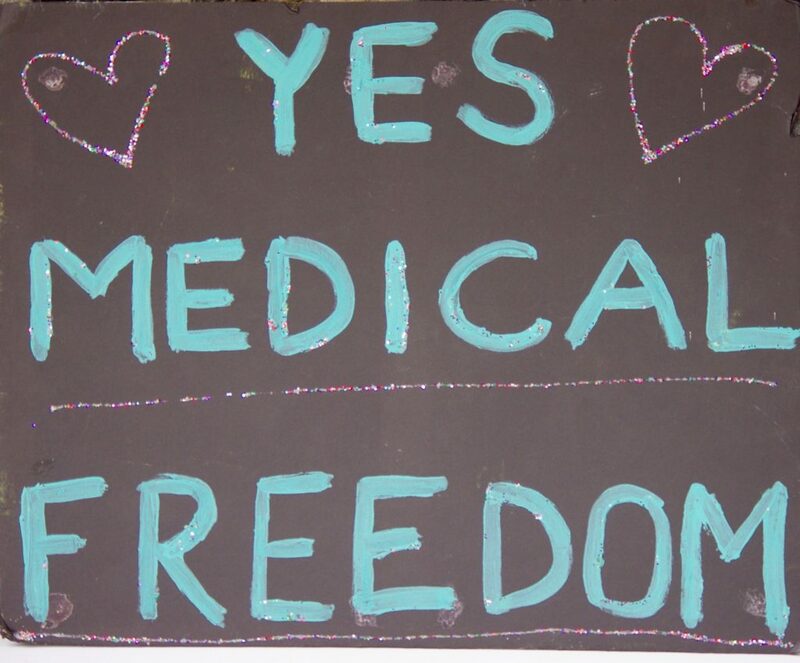 And, above all, I believe in medical freedom for every Oregonian. I am glad to read that the conversations about the safety and effectiveness of vaccines must also be undertaken. I believe that this for-profit legislation is an opportunity to share the enormous body of research that shows many established facts that those who only see the corporate-owned media will hopefully find astonishing and revelatory: vaccines are far less effective than they are told, vaccinated people can still get the diseases and transfer them, vaccines can even give people the diseases, vaccines can cause heinous life-long harm and death, contain multiple times the allowable amount of heavy metal poisons mercury and aluminum, diseases were in steep decline before vaccines were administered for a number of other reasons, pharmaceutical corporations are insulated from liability for the wide-spread harm vaccines cause, routinely lie about their effectiveness and safety and get caught for it, enjoy a revolving door of their executives into the top levels of the CDC and back again, and sell more drugs to treat the conditions that vaccines cause. There’s more, much more, but let’s start with this.